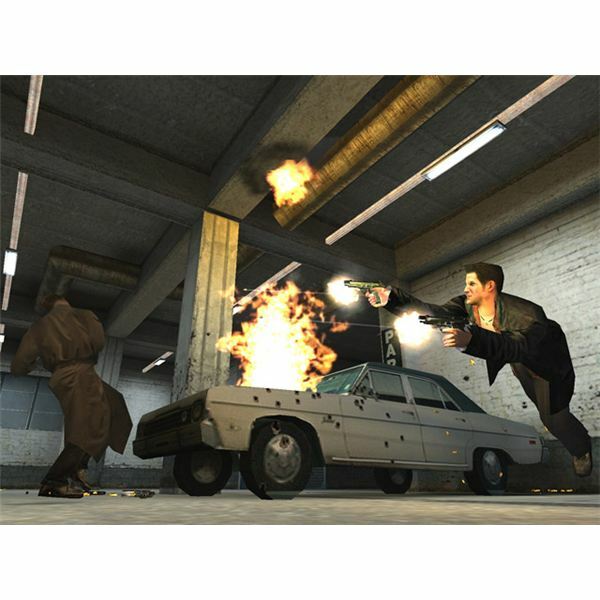 Max Payne is an old classic that is still a prime example of the third-person shooter. 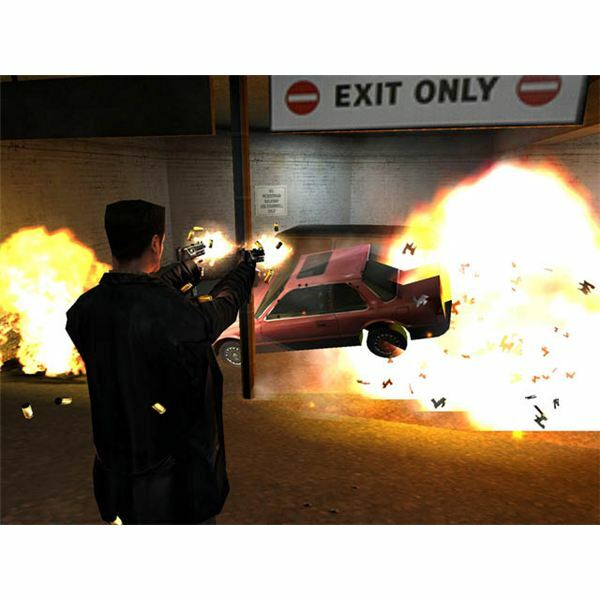 You play as Detective Max Payne as he fights through the criminal underworld in an effort to unravel a massive conspiracy. The graphics are obviously outdated and it's a fairly old game, but it is still worth your time. The main feature is the bullet time. You have the option to perform a move called a shootdodge. This makes Max leap out and slow time to get an advantage in a gunfight. You will really get into it after a little bit. The bullet time works perfectly to give you the feeling that you're in your own action movie. 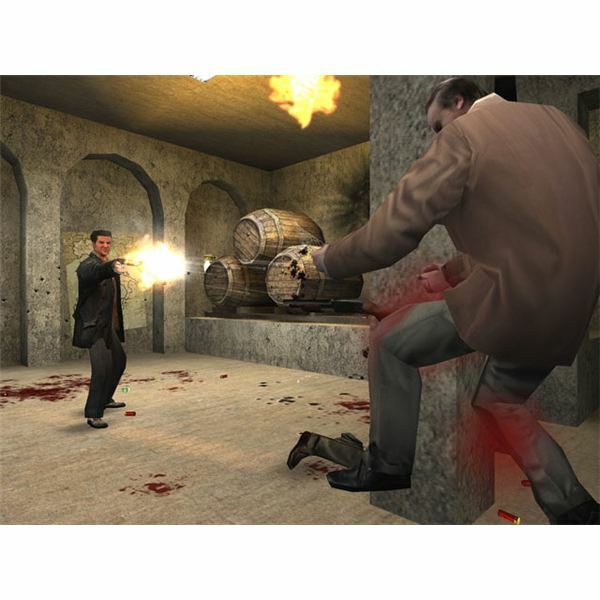 I don't honestly know of any game that lets you leap out from behind a corner in bullet time, shoot two enemies and then shoot another man as you slide across the floor while time speeds back up. It looks as cool as it sounds. The guns are fairly varied but they are almost realistic to a fault. A pistol shot to the head kills an enemy just as well as a shot from an assault rifle. This means that the weapons are basically just the same. You have pistols, shotguns, assault rifles, and a grenade launcher to fill up your arsenal, but it doesn't feel like it matters much. The AI is at least satisfying though, especially for such an old game. There really weren't any head scratcher moments of terrible AI stupidity, which is an accomplish for a modern game. It may be a little old, but the enemies will still challenge you. Another cool feature is the graphic novel style of storytelling. The story is told in the form of illustrated stills that build a graphic novel as you go along. The style just clicks perfectly with the game and Max's monologues to give an exciting cinematic experience. It's something that will stick with you if you are a fan of the genre. Max Payne is not known for its graphics. This was probably a very beautiful game when it was released in 2001, but it shows its age. The levels are drab and there's only a few models for the enemies, so you'll be fighting a lot of clones. It doesn't look bad necessarily. The character models are alright and you can always tell where the enemies are, but don't expect to be impressed. The good news is that those poorer graphics basically mean that anyone can play it. If you have a computer that was built in the past 7 years, you will be fine. The last time I played this was on my XPS with 3 gig of RAM and dual Nvidia 8700M GT cards. I had everything maximized naturally, but I have played it on older machines without any noticeable drop in quality. The official minimum requirements that you have 96 MB of RAM and a 16 MB graphics card. I would be very surprised if your Internet capable machine couldn't handle that. Max Payne is a game that just about everyone should play at least once. It is a true experience for any fan of modern video games and the story is one that you will remember. It's a little old and the graphics aren't great, but it's just fun. The bullet time is incredibly well done and it will really feel like you're playing out a movie. The other plus is the cost. You can download Max Payne and Max Payne 2 as a bundle from STEAM for $15. If you don't want to start using STEAM just for this game, then you can still pick up a normal copy from Amazon or eBay for about $10. You might even spot a copy in your local store's bargain bin. It's a great deal. I whole-heartedly suggest that you buy a copy and see one of the best shooters of the past.